Changes to old traffic regulations dating back to 1979 have been passed by the National Legislative Assembly. Police will have the power to confiscate vehicles used by drunks. Foreigners renting vehicles can expect to get fines through the post or by electronic means. Sanook reported that the decision to amend the law was virtually unanimous with three abstentions. It will next head to a government committee for ratification after some public consultations. It is expected that 12 points will be issued to each driver. They will lose points for each infraction - Sanook said this could be one point for going through a red light and three for not getting out of the way of an ambulance, for example. When all points were exhausted the licence would be suspended for a period. Points could be topped up if training was undertaken but drivers would have to pay for that. The above details are where the public consultation phase will come into play. When it comes to drink driving the police will have the power to seize vehicles and licences on the grounds that the driver or rider is a danger. After a period they will be returned. How fines are levied on rental vehicles caused much debate and the assembly was suspended for two hours after disagreement broke out when it was suggested that rental companies should be liable. This was deemed to be a bad idea as no one should be responsible for someone else's fines. In the case where the renter is a foreigner the person breaking the law can expect the fine to be sent to their address. It was not stated in the report if people could expect fines in their home countries after leaving Thailand. Thaivisa notes that in some countries fines are paid by renters via their credit cards - this option was not mentioned in the Sanook report. 12 points? In 1 year? 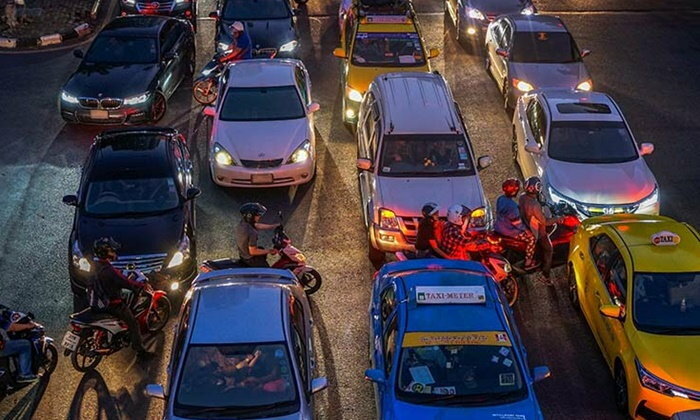 Most Thai drivers commit 12 points in half a day. Hard to believe that an ambulance can be a dangerously speeding pick up belching diesel trying to beat its competition to the accident. They need more clarity on that. Only one point deducted for going through a red light? Seems ridiculously lenient to me. Seems a bit harsh to be going around taking alcholics’ vehicles. police will have the power to seize vehicles and licences on the grounds that the driver or rider is a danger. Are we not the ones in Danger of these clowns? The fact that they have an allocated number of points for holding up an ambulance is astounding in itself. From the TV documentaries I've seen recently about the police in the UK, if they stop someone for an offence who are on holiday using a foreign licence, the police seem to have to power to collect an 'on the spot fine', ensuring the fine is paid. I'm surprised the RTP haven't gone down this route. There again, planning isn't exactly their strong point. This concept is pointless in Thailand...there is no one to enforce it...it doesn’t matter what the rules are if there is no one to enforce it. And can you honestly imagine the Locals having the ability to implement the infrastructure to do this (oh hang on, maybe onto something there, nice little 30% earner on the system build and commissioning even if it never actually gets used). now why is the car in my name!? Without traffic safety enforcement, no one's ever going to accrue 12 points. I always imagined Danny La Rue being caught drag racing.